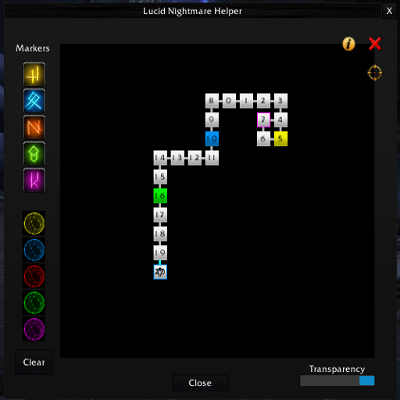 The lucid nightmare maze may seem completely random, but if you retrace your steps you will find yourself in the same room. For this reason, a simple map that traces your movements (north - south - east - west) can help you go back to those certain rooms that have an object of interest. The frame generates "rooms" as you move through the halls. There are five "Set" buttons that let you change the current room color, which can be used to mark a room on the map where an orb/rune is found, making it easy to retrace your steps when you need to return to that specific room. This addon isn't the solution to the maze, but a helping hand to avoid having to manually map with pen and paper. I used this addon and it was helpful, but there are two major things that make it not usable by itself: you can't reposition your arrow on the map, so if you get teleported, it just keeps making rooms. And there's no way to mark a teleport. However, it is much easier than a handwritten map when it comes to actually navigating the maze - especially once you have a map made of it. I moved back one room on the map, so that my arrow appeared on the map in the room I'd teleported from (the addon creates a new room rather than moving your arrow to the room you end up in.). Then I *closed the app*. Your arrow doesn't move while the app is closed (careful not to erase the map). Then I ran in a random direction until I reached a room that had an orb or glyph that was already on my hand drawn map, and I used the hand drawn map to navigate back to the room where I knew the teleporter was. Then I re-opened the app and used a wall to mark the teleporter (so because the map created an extra room, I knew that a wall between two rooms meant that it was a teleporter.). But that wouldn't have been necessary if your marker could be moved around on the map that is created by this addon. Overall, it's a good addon and it helped me a lot. Can you please update this addon for 8.0.1? Thanks! This Addon ist extremly useful! Just be sure to click the "skip room" button, when you have already marked the adjacent room-door X. Thanks alot! so i closed wow, to take a break, opened it up again, inside the maze, lucid program resetted, do i have to start over, when it comes to orbs? Can you please update this addon? Not working in latest version of WoW.. This saved the day! MAX 30min with perfect made map! Thank you SO much. That maze was a royal pain in the arse. I can't imagine doing it WITHOUT this addon!! Thanks for the addon, helped me do the maze in ~10 minutes. 2. If a user marks two room with the same mark ie red orb in two room. Make it offer to condense the map so both rooms overlap. This helps cause of the being thrown from one edge to the next when u hit the end of the map. The map condense option would be a godsend. I'm banging my head against the wall here trying to figure out why I keep running into the same green rune over and over again. would be great if the pause map generation actually worked.. also needs an option for do not map with the "have you seen this room before?" popup. Yeah, pause map generation doesn't work for me either. Lacking features. I switched from this with my friend after about 10 seconds over to an Excel Spreadsheet, and we spent 2+ hours mapping out what we could, however, after mapping everything (just in case I needed it), I decided to just grab the most unseen orb (purple for me) and just run until I found the ruin, did this for the others as well, never once looked at my map after I started just walking (auto-run with WASD for direction), and I completed it in about 25 minutes. So I spent an entire 2-3 hours mapping, and ended up completing it after 25 minutes of randomly running in directions and not consulting the excel map once. There's a lot of teleporters and things that screw your mapping up, and I followed a lot of what I mapped to the T, and it always changed. Your best bet, just run it. You'll spend more time on mapping than you will actually just running it and by chance getting the right Ruin, but that's all this is, chance with a very random algorithm. There NEEDS to be a way to drag the map around. I cannot see where I've been or reset rooms if they scroll off the edge. If that's not possible, then can we re-center the map on a specific room that we select? I'm not lost, I just can't make the map fully visible from where I am. It would also help so I could reference where I've been more easily when I think I've been teleported. EDIT: I throw out all my previous theories. I'm only continuing this because I'm so close to the end. Also, not fighting things is kind of restful. I'll live in Purgatory for a while. This addon worked great for me this morning, finished the maze at 8am EST. However, my guildie is trying to use it now at 10:30am and the addon is not tracking the rooms. Any advice? Thx! Can't disable map generation, any idea why? Is there also a way to delete rooms we've visited? After being teleported it really screws up the map and thus it would be nice if we could delete specific sections that we know are incorrect. yeah, the enable/disable button isn't working. big bummer because i wanted to stop mapping when i went through the warp room, but it kept on mapping and made a big illegible mess.